Can the UM installer merge all partitions into one and result in a safe system? I am planning to install Ubuntu MATE 16.04 on an older laptop and have chosen the 32-bit version. This laptop has an Intel Celeron M CPU and 3GB RAM. The problem is that the HDD contains viruses and three Windows partitions. I want to only use Ubuntu MATE. How can I make sure that Windows, all partitions and viruses are gone when installing UM 16.04? Will the UM installer merge partitions automatically and format the harddrive or should I prepare anything prior to booting from a USB drive? answer to your question is YES. During installation you will be asked if you want a clean install or you want to install it along side windows. There is a very intuitive partition manager that will help you achieve what you want. For more info check the installation instructions. Linux has an extremely low probability of being affected but … You don’t want to distribute malware. I don’t know if there’s anything important for you in the existing partitions. If there’s anything you would like to keep, then back it up. But if the answer is no, then let the Ubiquity installer reformat and partition the Hdd, my friend, because that will give you a completely clean disk, so bye bye Window$ and its never ending stream of viruses. Is this normal after the standard installation? Why would they be named 1,2 and 5 (what about 3 and 4?) and what are the differences between them? Do I have to reinstall or are the partitions I got through the standard installation as they are supposed to be? You can have up to 4 primary partitions (1,2,3and4) and no more. 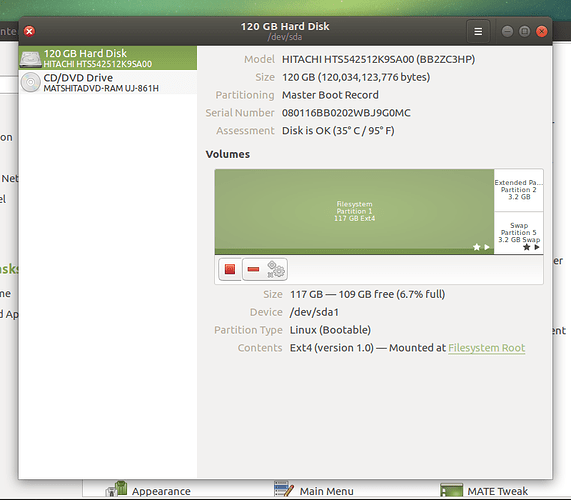 So your swap partition is on an extended partition which starts at partition #5 and can go on from there (6,7,8and on). So yes, you have a standard install and good to go. That is up to you, I would first check out the way the partitions are laid out using Gparted and then decide!. I am still confused about this. Each new standard installation always leads to three partitions? Why would my swap partition start with partition 5 and not with 3 if I only have 3 in total? What does the term "Extended Partition" mean? Is it safe to use this type of partition? Thank you very much @v3xx, this is very valuable information. I do not claim that I understand it completely, but I can now say that I have successfully installed UM 16.04 on this old laptop. Only the DVD drive is not working on this machine and I have started a separate thread on this here. I haven’t tried Gparted yet @wolfman but this will be one of my next projects in the future. I’m guessing, but maybe the installer earmarked the next available partition for the swap partition before it removed the 3 or 4 existing partitions.